The iconic MIT home page Spotlight features a daily-changing image and design that focuses on advances in research, technology and education taking place at the Institute. Though some Spotlights do run multiple days - for example Friday's spot usually runs through the weekend, we work very hard to maintain the daily-changing tradition. We've combed our servers and have compiled a digital archive of the Institute home page through the years - well over 2000 images. Enjoy! Today’s spotlight features a still from the Muddy Charles video by Melanie Gonick. Since 1968, the Muddy Charles Pub (opens in new window) has been a spot for the MIT community to relax, socialize, and share ideas. It’s also become a networking hub for researchers, entrepreneurs, and alumni (opens in new window) in the public sector and in industry. The MIT home page Spotlight showcases the research, technology and education advances taking place at the Institute every day. What makes it as a Spotlight image is an editorial decision by the MIT News Office based on factors that include timeliness, promotion of MIT's mission, the balance of interest to both internal and external audiences, and appropriateness. We do welcome ideas and submissions for spotlights from community members, but please note we are not able to accommodate all requests. We are unable to run event previews or promotions as spotlights; for those looking to promote an event, we are happy to include your listing as an event headline on the homepage (when space is available). For more information, e-mail the spotlight team. Request a Spotlight or Event Headline, here. 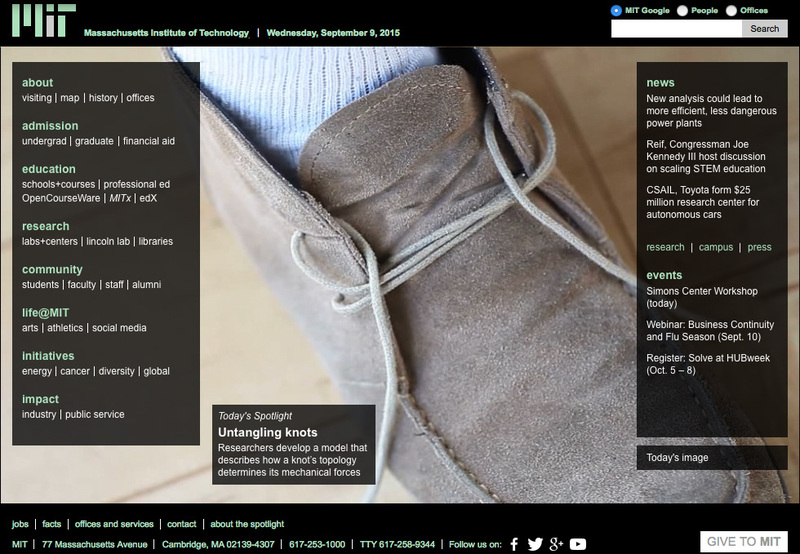 Today’s spotlight features a stock video of a person tying their shoes.